A Web ID number and password will be given to the chairperson at the start of this cookbook program. 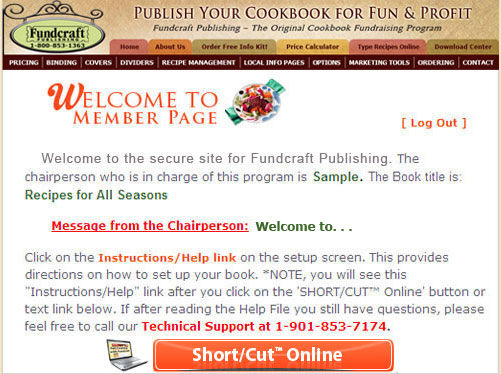 Every Fundcraft cookbook customer will be able to login at www.fundcraft.com. Short/Cut™ Online recipe typing program enables you to create and edit your cookbook online. If the chairperson decides to use Short/Cut™ Online, they can log on with their secure Web ID and password to customize their cookbook for their group. Cookbook Publishing has never been easier with Short/Cut™ Online [Online Cookbook typing software]. and determine if recipe notes will be used. Categories or sections used are: Appetizers, Meats & Main Dishes, etc. The chairperson can also determine if recipe notes will be used. Recipe notes allow each recipe contributor to enter comments about their recipes and are an additional charge. After the Chairperson has Customized their Cookbook, the Web ID is distributed to members of the group or friends and relatives throughout the world. 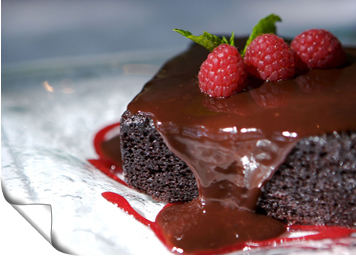 Anyone with the Web ID can log onto the site, select the correct category and type in their favorite recipe. When the Ending Date Posted by the Chairperson Arrives, the chairperson can check through all recipes by section and make the necessary changes. The chairperson can print the file to her own printer to read a hard copy of the recipe pages. When the chairperson is finished with the editing process, she clicks "Submit Book" to send the file to Fundcraft for final processing into a finished cookbook. In order to complete the program, the chairperson must complete and mail the cookbook order form along with copy for the cover and local information pages and any artwork to be included in the cookbook. When your Cookbook has been Formatted into the professional cookbook publishing recipe format your group selected, the billing correspondence person will receive an email notifying him that a proof copy of the recipe pages is available on our website for review if this option is selected on the cookbook order form. (This option must be selected on the cookbook order form). The billing correspondent will also receive separate emails for the cover proof, special pages proof, special divider proof, and advertising pages proof. Any corrections can be returned by email or fax, and Fundcraft will make the corrections. *Any changes to recipe pages will result in the deletion of the Short/Cut™ discount.